Yesterday our sweet friends John and Samantha invited us over for a BBQ, so I wanted to bring a dessert that fit the occasion. I didn't want to do anything too heavy or chocolaty, so my mom suggested this delicious dish. It was perfect for an outdoor get-together, and yall, this pie was delicious. Oh, I almost forgot, it's also the easiest thing to make. 2. Stir pecans, melted butter, and flour in a mixing bowl until dough forms. Press mixture into pie plate with your fingers, and bake about 25 minutes. Cool completely. 3. With an electric mixer, cream powdered sugar, cool whip, and cream cheese until incorporated. 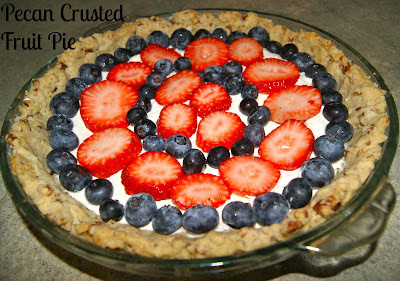 Spread mixture into cooled, baked crust. 4. Top with fruit. If not serving immediately, place finished pie in refrigerator until serving time. Enjoy! It was delicious Chelsea! I had great time last night! Thanks for posting the recipe; I will definitely be using it in the future. This looks so impressive! Thank you for linking up with Mouthwatering Mondays!